Details: Invite-Only event. Four games guaranteed (weather permitting). Played at the newly renovated Tigue Moore Field on the campus of the University of Louisiana Lafayette. The Ragin Cajun Coaching Staff are excited about the opportunity to scout prospective players throughout the event. Baseballs provided for all games. Teams are selected from a large database and intensive player and team review by 2Dsports & Five Tool. Request Your Invite today! 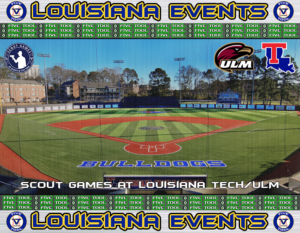 Social media coverage will be provided by @VToolLouisiana and @VToolShow. Details: Invite-Only event. Four games guaranteed (weather permitting). Played at J.C. Love Field and ULM. The Bulldogs Coaching Staff and Warhawks Coaching Staff are looking forward to scouting prospective players throughout this event. Baseballs provided for all games. Teams are selected from a large database and intensive player and team review by 2Dsports & Five Tool. Request Your Invite today! 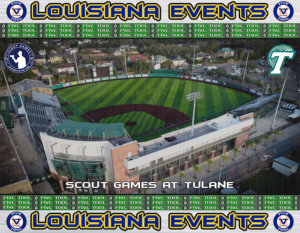 Social media coverage will be provided by @VToolLouisiana and @VToolShow. Details: Invite-Only event. Four games guaranteed (weather permitting). Played at Greer Field at Turchin Stadium on the campus of the Tulane University. The Green Wave Coaching Staff is excited for the opportunity to scout prospective players throughout the event. Baseballs provided for all games. Teams are selected from a large database and intensive player and team review by 2Dsports & Five Tool. Request Your Invite today! Social media coverage will be provided by @VToolLouisiana and @VToolShow. Details: Invite-Only event. Four games guaranteed (weather permitting). 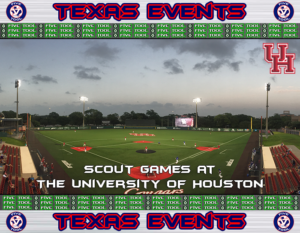 Played at Schroeder Park on the campus of the University of Houston. The Cougars Coaching Staff is excited about the opportunity to scout prospective players throughout the event. Baseballs provided for all games. Teams are selected from a large database and intensive player and team review by 2Dsports & Five Tool. Request Your Invite today! Social media coverage will be provided by @VToolTexas and @VToolShow. Details: Invite-Only event. Four games guaranteed (weather permitting). 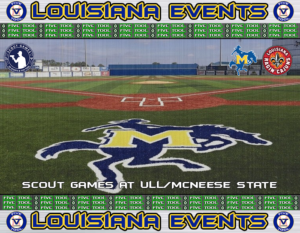 Played at the newly renovated Tigue Moore Field on the campus of the University of Louisiana Lafayette and Cowboy Diamond on the campus of McNeese State University. The Cowboys Coaching Staff and Ragin Cajun Coaching Staff are excited for the opportunity to scout prospective players throughout the event. Baseballs provided for all games. Teams are selected from a large database and intensive player and team review by 2Dsports & Five Tool. Request Your Invite today! 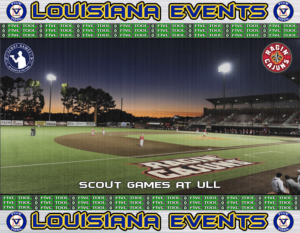 Social media coverage will be provided by @VToolLouisiana and @VToolShow.